The history of the factory Schaal begins with the Compagnie Pelletier & Cie, which originates from Henri Duthu’s dispensary, Queen Marie-Antoinette’s chocolate pharmacist. Introduce in France thanks to Anne of Austria, cocoa was used therapeutically at the XVIIIth century and found in the dispensaries of pharmacists. Henri Duthu’s one was located 56 rue Saint Denis. The Pelletier pharmacists were renowned. It is likely that Brother Eugène and Auguste might be parents with the famous Joseph Pelletier (1788-1842), inventor of quinine. Praising the benefits of chocolate, the pharmacist contributed greatly to the propagation of chocolate. With the widening chocolate consumption, manufacturers developed industrial equipment to speed up the production. The Pelletier House became famous for its invention of the Pelletier mill. The mechanical mills made it possible to grinding quality unequalled before and allowing to preserve the aroma of the chocolate. Proud of their father’s success and taking advantage of mechanization democratisation, the Pelletier sons, Eugène and Auguste, founded the Compagnie française des chocolats et des thés in 1853. They set up a factory in Paris and London; we’re still a long way from Alsace. At the XIXth century, chocolate consumption increases very much. To meet the demand for more affordable chocolate, some blends were permitted but only with pure flour and starch but less scrupulous fraudsters tricked the consumer with fake labels, while they coloured chocolate with red ochre. The Pelletier family took position in favour of quality and fair price. Pelletier’s brilliant idea was to associate clients to the company capital. This thought inspired in 1853 the drafting of the by-laws of the Compagnie des chocolats et des thés. It edited special shares reserved to clients who would like to supply themselves with teas and chocolates. Gathering an important capital of 150 000 francs, representing 3000 interest shares of 500 F, the Compagnie became owner of the factories. Cocoa planters were the main stakeholders, the maritime agency took care of transport and became its associate. Compagnie’s by-laws were founded on those association principles, organised under the judicial form of partnership limited by share. In this context, François Schaal based the Compagnie française in Strasbourg. 1871, the Pelletier brothers become associates with Schaal father and son in Strasbourg : a branch in the Alsatian capital. In 1871 the chocolate industry undergoes a great development. From chocolate powder invention in 1828 to milk chocolate in 1875, great dynasties such as Menier and Suchard were born. Since the early stage of the branch creation in Strasbourg, Eugène Pelletier let his brother manage the company. The success of letting the clients become shareholders of the company allowed to build a large and loyal customer base but Alsace and Lorraine annexation after defeat in the Franche Prussian war risked to jeopardize the company. Links with Germany were already well established: the company supplied the 750 cooperators across the Rhine. For August Pelletier, he had to be closer to Strasbourg and to cross the new border. The branch La compagnie française des chocolates et des thés was founded by Auguste Pelletier, François Schaal and his son Louis. The new company committed to give the Pelletier upon each balance sheet a percentage of the profits and in exchange the Pelletier would bring send them customers from Alsace and Lorraine, give his chocolate recipes, the right to sell his products under the house brand, a lease promise where the company would have to settle definitively. Auguste Pelletier bought two mills at Saint Martin Bridge, on the Ill River to power the advanced machineries similar to the ones in Paris and London. It was necessary to have constant water supply to cool down the chocolate temperature. The different generations of the Schaal family who were involved in the management of the chocolate factory have lived in the Finkwiller quarter, which had become a real chocolate village over the years. The company went from 16 workers in 1871 to more than 300 in 1926. Over the years Schaal become a famous figure of Alsatian chocolate. Other members of the Schaal family joined the company : the other son François, Georges entered the company in 1881 as co-manager. At Louis’ early death in 1889, he will become the director of the company. In 1891, Georges Schaal senior decides to buy the Compagnie française des chocolats et des thés of Paris, at the capital of 500 000 F. He came to an agreement with the shareholders of the Compagnie française Pelletier & Cie for the refund of their shares. Twenty years after the branch creation in Strasbourg, the Schaal family took control of the headquarters in Paris. The project lasted 13 years, but in 1904, the company was liquidated for reasons that are still unclear. Its goods were sold to the Poulain Chocolate factory in June 1904. In 1919 Georges Schaal junior bought back all the exploitation rights of the Compagnie française des chocolates et des thés from Poulain, except the brands National, Succulent and Lactat. During this year, after the reunification of Alsace and Lorraine to France, the company’s status were modified for conformity reasons. Article 4 implied the deletion of the definition of Commanditgesselschaft auf Aktien and the deletion of Article 8 about allowing to sell products in France. Years 1920 and 1921 were prosperous. In 1921, the chocolate factory is renamed Compagnie française des chocolats et des thés L. Schaal et Cie. Following years were less favourable. Indeed, selling in Germany is almost impossible and the competition was becoming harder and harder. To keep up they had to invest into new working space and machines. In 1923, the company is falls under the French law about business companies and limited stock partnerships with share capital. German are expelled from the freed territories and their shares are placed in escrow. In 1922, Schaal was able to refund the shares to former German shareholders. The company resumed its growth during the Twenties. Following the Versailles Treaty, Georges Schaal decided to build a factory far from the German borders. In 1926 he established a chocolate factory in Breuil en Auge in Calvados area with modern equipment. His brother Lucien was appointed director of the Strasbourg chocolate factory. Because of the war, the factory was closed and the family evacuated on the 1st of September 1939. They took refuge with Calvados in Breuil-en-Auge to resume the production. With the German army gaining ground, the owner had to leave again, this time for Donzère in the Drôme at the Aiguebelle chocolate factory. In September 1940, Germans developed great interest for the Schaal chocolate and took over the company, pretexting that the family belongs to the Jewish community. On the 6th of May 1941, a new administrative director, M. Kirchofer, was appointed. The family took refuge at Saint Raphael, helpless at the sight of this spoliation. During year 1944, Georges and Lucien Schaal received a letter listing their goods left in Alsace. On the 23rd of November 1944, Strasbourg was freed, and the Schaal family moved back to Alsace to reclaim their goods. In 1953, Georges lost 2 of his children and died after falling on his property in Saint Raphaël. He knew how to select the best beans and get their best out of them for the end product; the leading product was the praline. In 1948, only Schaal and Suchard are still registered in the Strasbourg directory. In 1953, at his father Georges’ death, when Raphaëlle Schaal-Bollack took the management of the company, 3 new chocolate factory had appeared: Menier, Poulain and Stanislas. Till the sixties Raphaële tried to modernise the factory. Schaal family owns important shares in the company. The shareholders list is long and prestigious and mentions in particular the name André Burrus. In 1967, Raphaëlle Schaal sells the factory. Paul Burrus buys it. His family worked in the chocolate trade since 1914.
factory in Geispolsheim is ready to welcome the new staff members. Paul Burrus, passionate about mechanical engineering, will make substantial technical improvements to the machines. In 1973, he buys several factories that have a huge distribution network with shops and professionals: Marquise de Sévigné, Salavin and the Martial dragées. In 1980, Jean-Paul Burrus, the current president of the group, manages the company. 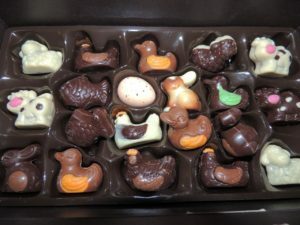 Production tools are more and more automated, allowing for accurate decorations, such as applying the fork lines or the gold powdering on the chocolate candies. By creating the SALPA holding in 1997, JPB engaged in diversifying the industrial and commercial diversification policy in the trade of tea and coffee. By doing so he returned to the roots of “la Compagnie Française des Chocolates et des Thés” and to its foundations in 1853. Today, Schaal showcases thousand references of finished goods representing a production volume of 2 million tons a year.